Vinesh Phogat created history today by winning the women’s 50kg freestyle wrestling gold. In the process, she also became the first Indian women’s wrestler to bag a gold at Asian Games. Vinesh defeated Yuki Irei of Japan 6-2 to clinch the top prize and take India’s tally to five medals (2 gold, 2 silver and 1 bronze). Earlier in the match, Vinesh took down the Japanese opponent and bagged four points to draw first blood. Irie tried to counter attack but Vinesh’s defense was as compact to not give any chance to the opposition. The Japanese wrestler later got one technical point before the 1st half. In the second half, both the wrestlers tried to take on each other but the time went through and Vinesh eked close to bag the gold. Irie again got a technical point in the closing minutes of the match but Vinesh hit back in the last second and took down her opponent to bag two points and close down the match 6-2. 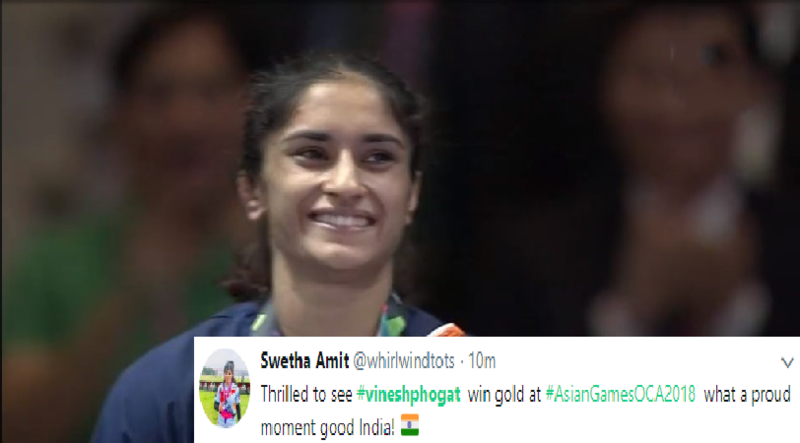 In the first bout, Vinesh was up against China’s Sun, against whom she had suffered the career threatening leg injury during the Rio Olympics. This time the Indian took the revenge of that heart-breaking defeat 8-2. She later thumped Korea’s Hyungjoo Kim by technical superiority and her semi final bout lasted for just 75 seconds where she rolled over her opponent thrice with leg-lock to close down the match. This is India’s second gold medal at the Asian games 2018, both coming from wrestlers. On the first day of the event, Bajrang Punia bagged gold in men’s 65 kg freestyle wrestling. This is India’s third medal on the day and they have surely got all their corners covered. Dinesh Kumar won bronze in men’s 10m air rifle event, Lakshay won silver in men’s trap shooting and now Vinesh cliched gold in women’s wrestling.